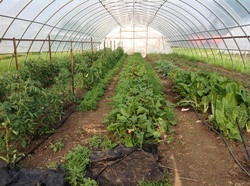 Our family offers a wide range of fresh, naturally grown vegetables at the Kossuth County Farmers' Market and CSA deliveries during the growing season. Our vision for Bode's Moonlight Gardens is to create an environment that nurtures growth of both food and family, while providing meaningful work. We aim to provide delicious, healthy food for ourselves and others to enjoy, preserve the soil and our rural environment and participate in educational opportunities regarding local agriculture. Currently we sell our products through Community Supported Agriculture (CSA) shares, sometimes called Farm Shares, and at the Kossuth County Farmers Market. At this time we do not offer u-pick on our farm, but we look forward to seeing customers at the weekly farmers market. Interested in serving more fresh, local foods? Let us know how we can help! We were both born and raised in Iowa and after seizing the opportunity to live, work and travel in and out of the United States, we chose to return in 2003. Some of our favorite faraway places that helped shape us along the way were Holden Village in Washington state, Lutheran Volunteer Corps and Thornton Friends School in Washington, D.C. and (not so far away) Oak Center General Store and Earthen Path Organic Farm near Lake City, MN. We continue to enjoy our ongoing adventures in North Central Iowa. We began our journey as parents and new farmers about the same time and found both to be a joyful challenge. Much of our work seemed to get done late at night, by the light of the moon and our headlamps, with the baby monitor close at hand. Transplanting onions or tomatoes under the stars was often the most peaceful part of our day. This led us to the eventual name of our farm, Bode's Moonlight Gardens! These days, we still do a lot of our transplanting at night. Our plants seem to enjoy the evening hours as much as we do!